There are some great deals to be had when buying a pre-owned mobility scooter. 1. Has the Scooter/Power Chair been left dormant (not charged on a regular basis) for any long period of time? If so this can have a detrimental effect on the batteries. 2. How much will it be to replace the batteries if needed? Get a quote from your nearest Mobility retailer to get an idea of how much some new batteries would be if needed. (Note: When changing the batteries on a Scooter you have to replace both batteries). 3. Compare prices with other models on buyandsellmobilty.com to make sure you are paying a fair price. 4. Does the warranty transfer with the Scooter/ Power Chair? Yes, the warranty will transfer with the Scooter/ Power Chair, but it is worth checking with the manufacturer to see if the warranty is still valid. 5. Can you get Insurance for pre-owned mobility Scooters/ Power Chairs? Yes. Contact your nearest Mobility retailer for more details. 6. Does the charger work? Make sure the charger for the Scooter/Power Chair is working; otherwise this might be another cost you will have to incur. 7. Is the Scooter/ Power Chair still in Manufacture? If the scooter is very old it might be very difficult to get new parts or repairs on the Scooter/ Power Chair. Check the internet to see if the Scooter/ Power Chair is still in manufacture. 8. Make sure you are familiar with the rules for using Mobility Scooters and Power Chairs. Even though there is not a legal requirement to take a driving test it is advisable to make yourself familiar with the different rules regarding Pavement Scooters and Road Scooters/ Power Chairs so that you do not cause harm to yourself and others. Information on the safest way to use Scooters and Power Chairs can be found at www.bhta.net. 9. Have a Test Drive. Make sure you have a drive of the Scooter/ Power Chair before you purchase it, as this will tell you a lot about the condition and whether or not it is suitable for you. 10. If it’s a road Scooter you are buying, then make sure it is taxed. If you are purchasing a Road Scooter which you intend to take on the road then make sure it has a valid Tax Disc or contact your nearest Mobility Retailer to apply for your FREE Disc from the DVLA. If you are one of the 1 in 3 adults in the UK with high blood pressure you may be mystified as to why you have it. This is because in only 10% of cases is there a known physical reason for it. That means that for over 90% of people with high blood pressure there is no identifiable medical cause. This type of high blood pressure is labelled ‘Primary’ or ‘Essential’ Hypertension. Because there are very clear associated risks with strokes and coronary heart disease most sufferers then start taking medication to control their high blood pressure – sometimes for the rest of their lives. What is well known about the causes of this type of high blood pressure is that there are often aggravating factors. There are a tiny number of people affected by sodium, but scientific opinion nowadays is that the link between salt and hypertension is very tenuous. The aggravating factors that undoubtedly have the most impact are a lack of exercise, being overweight, smoking or drinking too much alcohol. It certainly makes a lot of sense to consider these factors and make any necessary lifestyle changes. But for many people, even when these factors have been eliminated, their blood pressure still does not go back to a safe level. The prevailing theories are that an underlying emotional factor known as ‘Sympathetic Overstimulation’ is responsible. In other words stress, worry, anger, anxiety and fear. When we feel these emotions we release stress hormones and a variety of physical changes occur in our body, including a rise in blood pressure. And if you live daily with these emotions it may be the cause of your primary hypertension. The good news is that there is much that you can do yourself to address these emotional factors. It might mean just buying a relaxation CD to listen to each day, finding an absorbing hobby, taking more exercise or having more fun with family and friends. For those who require more support however, there are hypertension professionals who will work with you, to reduce the stress in your life as well as make any lifestyle changes necessary. You really do not have to resign yourself to a life of high blood pressure. For years we have been told to be very wary of the sun. With ever increasing levels of skin cancer the advice has been to cover up with sunscreen or clothes and stay out of the sun. When my daughters attended primary school I packed them off to school already smothered in high factor suntan lotion, with a spare tube in their bags. But there is a shift now towards recognising that sunshine is a good thing and actually beneficial to our health. We all know that the sun makes us feel better, it improves our mood, lifts our spirits, it’s generally good for our souls. But beyond that, sunshine is an absolute necessity for our health due to its essential role in vitamin D production. No doubt you have heard about vitamin D deficiency, especially due to our poor summers. But even with a relatively sunny summer a deficiency is possible since we live in the Northern Hemisphere. The way to optimise vitamin D status in our bodies is to expose our skin to the sun for at least 15 minutes a day (before skin starts to redden) without suntan lotion. Common sense is needed as lying in the midday sun on a hot day may cause many people to start to burn and burning is not what is required. In fact very suntanned skin may inhibit vitamin D production. So mid morning or later in the afternoon when the sun is not at its peak is best. We need to try to maximize our exposure during the summer months. Vitamin D is fat soluble so it will be stored in the body, but because of our long dark winters our stores may become depleted before winter is over. Why is vitamin D so important? It supports our natural immunity, bone health and strong teeth. We are even hearing cases of rickets emerging again. Diet is important too but the amount obtained from food is small compared to the sun. The only sources are from fats in the diets such as butter, oily fish, milk and dairy and some foods are now fortified with it due to falling natural levels. So enjoy the sunshine, roll up your sleeves, leave off the SPF unless very hot sun or prolonged exposure, and welcome in this important vitamin. As I write this Spring is finally on its way. The bulbs are out, the trees are starting to turn green and the birds are singing. This puts a smile on our faces but does it translate into more natural energy day to day? Of course at all times we want to feel vibrant but our lifestyles and food choices may hinder these feelings of wellbeing. Some people choose to undertake a detox but rather than consider restrictive practices, here are a few tips to follow in the coming months ahead. I see many people who don’t consume sufficient hydrating fluids. This is not just about water but herbal teas or very diluted juices or cordials too. I always start my day with slices of lemon in warm water- so refreshing! Cut back on teas and coffees that may add stress to the body and replace with these more natural alternatives. Try to avoid packet foods as much as possible. The more packaged foods we buy, the more likely it is to be processed in some way and therefore contain hidden chemicals, sugars, salts or “bad” fats. Vegetables, fruit and protein foods (such as chicken, eggs, fish) are not processed and therefore your body has less to deal with in terms of digestion and the toxic load – especially if organic. Add to this nuts and seeds- yes they are in a packet- but only for the shops’ convenience. These are a great replacement for biscuits, cakes or crisps. A fantastic source of essential fatty acids- those that the body cannot make for itself. These fats are so important for our skin, brain, cardiovascular system, joints. In fact every cell membrane including nerve cells are composed of these fats so we must have them in our diets! These fats, together with protein foods, also help to keep us fuller for longer so we’ll be less likely to reach for unhealthy foods. Do eat as wide a variety of vegetables as possible. Different colours have different levels of antioxidants, minerals and vitamins so don’t stick to the same ones, be adventurous. Have at least a third of your plate filled with a variety to maximise your nutrient intake. Eat a couple of pieces of fruit a day but favour vegetables which are less sugary and so help maintain stable blood sugar and energy. Lighter days call for lighter foods – use this time of year to lighten the load and see the benefits. To find the perfect scooter you need to consider your lifestyle. In the following pages, we have highlighted some key things to think about before you select your scooter. Where do I want to use the scooter? Indoors – size of doors? Outdoors – level or rough ground? Are dropped curbs available? Do I need it to go in a car? Does it dismantle easily? Who will dismantle it? How often? Where will my scooter be stored and charged? Will I be on the scooter for long periods? Is there clear indication of the amount of charge remaining? Have the batteries been regularly charged whilst it has been un-used? If not what cost implications are there for replacing the batteries? Who will service my scooter? Do I want a warranty or insurance to cover my pre-owned scooter? Is the scooter available in different colours? What warranty do I get with the scooter? Is the seller governed by the British Health Care Trades Association (BHTA)? What are my rights to cancel the order? Which Scooter should I choose? Is the scooter comfortable to ride? Can I get on and off it easily? Are the controls suitable and comfortable for me to use over a long period? Is the scooter going to suit my needs? Can the scooter carry me and my shopping if required? Will the scooter be suitable for all types of terrain I anticipate wanting to use it over? Do I need the scooter to climb curbs? Can I dismantle the scooter and transport it in the car if needed? Does the scooter give me the mileage range I need, not only when shopping locally, but also, for example, when I want to visit a National Trust stately home or garden, participate in outdoor activities or when I go rambling? Is the scooter stable and safe enough for my needs? Do I have somewhere to store and charge up my scooter? Car portable: Easily dismantled into small parts that can be transported by car. Pavement: Larger more stable scooters that can carry shopping and go further distances. Limited to 4mph. Road: Designed for longer distances and road travel. Have the options of Pavement and Road use, usually have higher ground clearance and can travel at 8mph. All Terrain: Have very good ground clearance, very robust and designed for travelling over fields and grassy areas. We hope that this information helps you with your search. If you require any more assistance then please ‘Ask the expert’ for more details. These bath lift work on using compressed air to inflate and deflate the bath lift in order help the user get in and out of the bath. 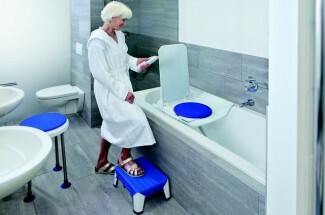 Enables the user to reach the bottom of the bath as if there was no lift. Easy to transport as they are light in weight. Can be a little bit unstable for those users who are not very confident. Are usually more expensive than solid bath lifts. Not as easy to recharge as the solid bath lift. 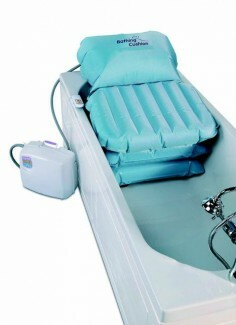 These bath lifts work on a hydraulic piston that lifts the user in and out of the bath on a stable and solid platform. Stable and secure for fragile individuals. Do not lower the user right to the bottom of the bath so bath needs to be filled up more than usual. A bit heaver to transport. Both types of bath lifts are battery powered and need to be re-charged on a regular basis. Has it had much use if it is pre-owned? Will it fit into my bath? Do I need to take the bath lift in and out of the bath tub regularly? If so can I lift the bath lift? Has the bath lift been charged regularly even if it has not been used (pre-owned only)? Do I require a warranty on my bath lift? What weight capacity will it take? We hope that this information will help you find what you are looking for. For any further advice please ‘Ask an Expert’. Your bed could be the cause of back pain and the British Chiropractic Association has some great advice for sleep posture and how to choose your bed and pillow. Choosing the right bed can minimise those factors that may lead to back pain. We come in different weights, shapes and sizes, but have one thing in common; we spend more than a third of our lives in bed, so should choose our beds carefully. Which is better, a hard or soft mattress? The best mattress is a ’supportive one‘. A 16 stone person sleeping on a mattress may not get the same support as a 10 stone person sleeping on the same mattress. How do I know which is the right mattress for me? mattress with a built in memory foam topper which is a good combination. The best way is to try out different mattress with a specific budget in mind, but beware you usually get what you pay for, so it is not worth skimping on a mattress if you can. What things can I do to help prevent back problems even with my new mattress? well hydrated; dehydration can make muscles ache. Don’t leap out of bed first thing in the morning. After you wake up, try some gentle stretches. Wake up your body. Once up, avoid bending or doing anything sudden or strenuous until you back wakes up! If you do have back pain do not leave it too long to get it looked at by a chiropractor, the longer you leave it the more likely the condition will become chronic and more problematic. Written by David Eatwell, Director, Assured Mobility. The Shoprider Sovereign 4 is that one scooter that everybody recognises. It has been a staple of the high street for over 10 years now, and for good reason. This old trooper has changed little over these years and has remained at the top of the best-selling scooter list for many years. Why is this? I will be the first to admit that the Sov 4 (as it’s known in the business) is not my favourite looking scooter. Its box like frontage and less than elegant rear are quite dated by modern standards, but that hasn’t stopped thousands of people buying this tried and tested classic. In a market where new products are being launched on a regular basis you would be forgiven in thinking that there was not much of a future for the Sov 4, but it might just be this ‘familiar face factor’ that is one of reasons it has stood the test of time. Many a keen customer has come in asking for the Sov 4 as a result of their friend having one. Highlighting the importance of reducing the risks associated with buying a mobility scooter which is unfamiliar to a consumer. Of course familiarity is not a big enough reason alone to warrant the success of a product, there needs to be substance behind the popularity. This is where the Sov 4 triumphs. For a consumer demographic which values low risk and reliability the Sov 4 is one of the least visited scooters by our engineers. It has great reliability due to its basic, but effective, electrics and its simple construction, meaning that people can be confident that it will get them from A to B on a regular basis. A valuable asset when your independence is at risk. With a solid frame and good leg room this scooter has all the attributes a person needs to keep them independent and mobile. Easily obtainable spares and a good warranty (lifetime on the frame and structural components) means this scooter is the ‘go too’ option for many an undecided buyer. So if you are looking for a trusty companion who’s looks have faded a bit, but who won’t let you down look no further than the Shoprider Sovereign 4. This relates to the type of back cushioning the chair has. For example: this chair has a Waterfall style back, a very popular choice due to its softness and versatility. Each cushion can be adjusted and stuffing can be added or removed from the cushions. Other examples of chair style are Button back, Firm back, backs with lateral support and backs with lumbar support. Check with the seller to find out what style of back the chair your buying is. The choice of mechanism determines the way in which the chair lifts and reclines. Each mechanism has its own unique benefits. Single Motor Recline: Single motor mechanism which raises the footrest and tilts the backrest away from the seat. 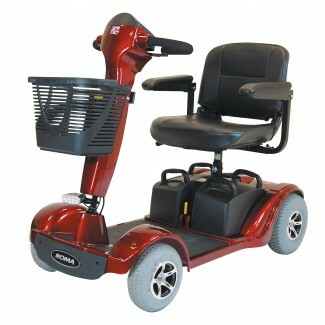 Dual Motor: Back and footrest are operated independently by separate motors. 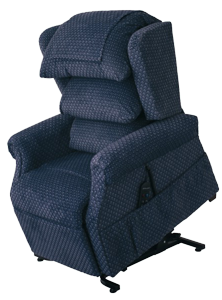 2 Way tilt-in-space: Single motor mechanism that maintains angle of back and seat when reclining and lifting. Good for people with bad circulation as this raises the feet up and spreads the surface area of the body thus reducing the risk of sores. Dual motor Tilt-in-space: An independent motor for the backrest with the added benefits of a tilt in space action with high leg elevation. Most of the people using these chairs will be sitting for long periods of time, so it is vital that the chair fits the user correctly in order for them to be comfortable. The dimensions to consider are illustrated on the image. There are a range of fabrics and finishes available which can affect the cost of the chair. You can have specialist fabrics which are waterproof and anti-bacterial. Check before you by to see if the chair has a special fabric. Where possible try the chair out before you purchase it, just to make sure it is comfortable. From when the gardening season begins in spring and until the end of the summer chiropractors have an influx of patients with back pain caused by over-zealous gardening. 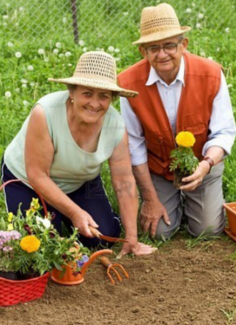 The main cause of back pain when gardening is prolonged stretching and overuse of the ligaments and joints in the spine. 1. Get your muscles warm before doing any stretching. You should never stretch a cold muscle as this increases the chances of injury. Get your heart rate up by doing some brisk walking or even some gentle jogging if you are up for it. 2. Do not bounce or jerk your body when stretching and stretch only as far as comfortable. You should not feel any pain, just tension in the muscle you are stretching. 3. Start with lighter jobs first. Once you are warmed up and ready to start, don’t dive into the heavy garden work first. Start and end with the lighter jobs, this will prepare your body further before heavy work and help you cool down at the end. 4. When raking leaves draw the rake in the direction of your navel. 5. Kneel on one leg rather than bending down repeatedly from the hips and use a cushion to support your knee. 6. Try and keep your back hollow when digging, with the legs spaced apart. 7. Try and vary the tasks of the day into short bursts of different activities rather than slogging all day at one thing. 8. When mowing lawns with a hover mower try to resist the temptation to swing the mower from side to side in an arc. Instead, mow forwards and backwards as you would with a conventional cylinder mower. 9. Keep yourself warm and covered, i.e. keep shirts tucked in as this prevents the muscles becoming chilled. 10. If you ache the next day; rest and seek the advice of your chiropractor who will advise whether you should apply heat or icepacks to the area, or indeed require further treatment. REMEMBER – You should exercise to keep fit so that you can enjoy your gardening rather than using your gardening to keep fit!